COMMENTARY ON "P a u l ’s   A u t h o r i t y   a n d   G o s p e l "
This week’s lesson veers away from the actual core of the first chapter of Galatians. The author attempts to explain the verses of this chapter with an emphasis on Paul’s authority and the opposition leveled against him by his detractors. In fact, while the lesson does mention doctrinal purity and points out that Paul had strong words for those who deviate from it, the lesson fails to recognize the real point: there is only ONE gospel, and any deviation from it is false. The Teachers Comments on page 30 state the lesson’s bias towards the book of Galatians and explains the fact that the author spent a week discussing Paul’s opposition, Paul’s authority, and Paul’s validity, but it misses that this is a passionate defense of the true gospel that established a new covenant and made the Mosaic law obsolete. In fact, the book of Galatians is not primarily a book about authority or why we believe what we believe. It is a book explaining the heresy of Judaism, the false gospel of requiring adherence to Jewish laws and traditions once a person has heard the gospel of Jesus’ life, death, and resurrection. Moreover, the gospel that changes our lives is not “the gospel [Jesus] lived and preached”. Jesus’ ministry was apologetic, demonstrating His identity, His fulfillment of the prophecies that a Redeemer and Deliverer would come. His teaching of the kingdom of God and what life in the kingdom would look like demonstrated the effects of the gospel, foreshadowing what was to come, but the actual GOSPEL was what Jesus DID on the cross and in the resurrection. Adventists (as well as many liberal Christians who do not believe the Bible to be inerrant and sufficient) teach that Christianity means following the teachings and imitating the life of Jesus. In fact, this belief is NOT Christianity. Rather, being a Christian means one has acknowledged his intractable sin and has trusted Jesus’ death, burial, and resurrection as the payment for His sin and as the consequent breaking of the power of death for those who believe. Without this basic understanding, no one can even talk about the “gospel”. Galatians is meaningless if we read it with an eye to delving into personal motives and authority and power plays, missing entirely the power of the reality that because of Jesus, the law is fulfilled and obsolete. THIS fact is the point of Galatians! This questions is nonsensical speculation. God sovereignly gave His eternal Word to the writers of Scripture. There is no other possibility for how He would write to us. His word to us in Scripture is sufficient and inerrant, and He chose to communicate to us TODAY with these very words. There is no other possibility of words from God. The Bible we have is the Word God has spoken to us, today and always. These questions are beyond ironic. Because Adventism has a prophetic voice continuing to define Scripture to the organization, generation after generation, no Adventist has a worldview that is based on the Bible alone. Ellen White’s Great Controversy paradigm has completely shaped Adventism’s understanding of Scripture. Even unknowingly, Ellen White has given Adventists an unbiblical worldview that denies the human spirit and natural depravity. She has given Adventism a fallible Jesus who could have sinned and who inherited Mary’s sinful propensities. She has given Adventists an incomplete atonement at the cross, making Jesus’ blood first defiling heaven by carrying people’s confessed sins there, and then by “applying His blood” in the heavenly sanctuary as He continues the investigative judgment. She has made Sabbath the seal (or the sign of the seal) of God instead of the Holy Spirit, and she has made Satan the scapegoat who ultimately is punished for the sins of the saved. Ellen White has given an entire religion a sense that they alone understand the Bible, but she has cleverly shaped utter heresy into a religious worldview that has blinded Adventists to the power of God’s word. The though question at the end of Monday’s lesson is incredibly ironic. At the end of today’s lesson, readers are asked to write down their understandings of the gospel and take that written understanding to class on Sabbath to discuss. Again, this is off-topic and completely speculative. The Bible CLEARLY articulates the gospel (1 Cor. 15:3-4), and there is no murky confusion about what a person’s idea of the gospel is, or what one can learn from others about the gospel. In fact, most Adventists cannot articulate the gospel when asked, because Adventism includes so many things in their “gospel”: the three angels’ messages; the Sabbath; the health message; the second coming; a social conscience, and more. The truth is that the gospel is that Jesus died according to Scripture; He was buried, and He was raised on the third day according to Scripture. His death was a substitution for us; He became sin for us. He resurrection was the proof that His death satisfied the righteous wrath of God and broke the curse of sin into which the entire human race has been bound since Adam. We are born condemned (John 3:18; Col 1:13; Eph. 2:1-3). We are made alive when we trust the gospel of Jesus’ death, burial, and resurrection (Jn. 5:24). Today’s lesson brushes over one of the Bible’s strongest statements of adding to or altering the gospel. While the author does address the fact that Paul said those who deviate from correct doctrine of the one true gospel should be under the curse of God, the lesson never actually says what was WRONG or what the gospel was which these false teachers were promoting. I am astonished that you are so quickly deserting him who called you in the grace of Christ and are turning to a different gospel—not that there is another one, but there are some who trouble you and want to distort the gospel of Christ. But even if we or an angel from heaven should preach to you a gospel contrary to the one we preached to you, let him be accursed. As we have said before, so now I say again: If anyone is preaching to you a gospel contrary to the one you received, let him be accursed (Gal. 1:1–9). In reality, Adventists should be deeply convicted by this introduction. Any perversion of the death, burial, and resurrection of the Lord Jesus which brought us peace with God and lavished His grace on us because He gave Himself for our sins—any addition of confusion of that reality should realize Paul is saying they should be accursed. Moreover, Paul’s passion is directed at those who promote and teach a false, deviated gospel. Those who distort the gospel are leading people away from Christ. The lesson completely avoids pointing out what Paul is actually saying here and allows the Adventist readers to believe they know “the gospel”. Moreover, the lesson is vague and blurred enough that an Adventist reader could go through the day’s study and believe that if anyone deviates from Adventist belief, he should be accursed. Yet Paul is saying something very clearly: anyone who teaches or deviates in any way from the power of Jesus’ death for sin and His resurrection as the source of our spiritual new birth is teaching heresy and is under condemnation. Once again the author focusses on the interactions between Paul and his detractors and misses the actual point. The lesson ends with questions about how a person can know God’s calling, as Paul knew his. In fact, Paul rails against circumcision in this book not because Gentiles were not culturally bound to be circumcised but because, as explained in detail in Acts 15, the gospel denies that gentiles are to be brought under the law. Circumcision was the entrance sign into Judaism. A God-fearing gentile could worship in the court of the gentiles at the temple, and they could even listen to the teaching in the synagogues. But they could not be considered Jews unless they were circumcised. Moreover, the law was not even theirs to keep if they were not Jews. Uncircumcised gentiles could not participate in Passover or keep the Sabbath or participate in any of the Jewish religious ceremonies and rituals. Circumcision was the entrance sign into the law. When Paul became angry that the Judaizers were demanding circumcision, it was not because it was a needles rite. Rather, he was angry because requiring circumcision was a FALSE GOSPEL because it put the circumcised under the law. To circumcise and gentile convert to Christianity put that person under the law, saying that a Christian had to be Jewish and keep the law in order to be a true Christian. He couldn’t believe in Jesus alone; he had to adopt Jewish law. It was THIS PERVERSION, putting people under the law when they became Christians, that caused Paul to say anyone who preached anything other than his gospel was under a curse. Christians are not to be put under the law. 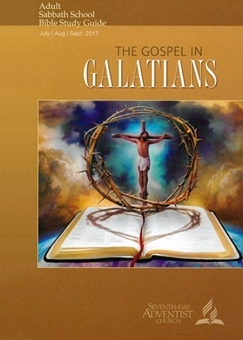 Adventists should be deeply convicted by the book of Galatians, but the author of these lessons has blurred the truth out of these passages and has put the focus on interpersonal struggles and subjective questions about one’s own calling. Again, while Paul dealt specifically with the validity of his apostleship and calling, the point was not to vindicate himself. Rather, it was to stress that the pure gospel of the Lord Jesus fulfilling the law and rendering it obsolete was the true message God was giving. Paul’s defense of his authority was not the point. His authority would mean nothing if his message were obscured. Paul defended his apostleship because his message, that the law was obsolete for gentile Christians and to demand that Christians be required to keep any of the law was heresy—that message made the Judaizers blindingly angry. Even today the message that the law is not for Christians, that the law of Christ and the indwelling Holy Spirit is the rule Christians live by, makes law-keepers angry. Circumcision, Passover, new moon festivals, Sabbath—these things are merely shadows which are not fulfilled. None of them are required. Now we worship the Lord Jesus who died for our sin, who was buried, and who rose on the third day, breaking forever the curse of death for all those who believe! Copyright 2017 BibleStudiesForAdventists.com. All rights reserved. Revised June 29, 2017. This website is published by Life Assurance Ministries, Camp Verde, Arizona, USA, the publisher of Proclamation! Magazine. Contact email: BibleStudiesForAdventists@gmail.com.